The West Michigan Park Association built the Hotel Ottawa in June of 1886 at a cost of over $20,000 (about a half million dollars in today’s value). This undated photo was probably taken on July 4, 1886 shortly after the Hotel Ottawa first opened. The two story hotel with 36 guest rooms was built atop a bluff facing Lake Macatawa, and Lake Michigan could clearly be seen to the west. Note the windmill visible at the right behind the hotel which supplied water for the hotel and the cottages. Half of the cost of building the hotel came from the sale of the cottage lots, with the rest of the money raised through the sale of bonds. Within a year of the opening of the new Hotel Ottawa, 20 summer cottages were built in the West Michigan Park Plat. The majority of the historic cottages standing today at Ottawa Beach were built between 1887 and 1900. All building materials – the lumber, bricks, window glass and furnishings – were transported to Ottawa Beach by boat from Holland until completion of the railway line. There were no roads from Holland to the lake shore and the only way of reaching the two resort hotels was by one of the two excursion steamers. In 1890 a two story hotel annex was constructed and telegraph service was added at the Hotel. The annex added 104 guest rooms, half with a view of Lake Macatawa, the other half having a clear view of Lake Michigan. The season for the hotel and cottages generally ran from the last week of June to Labor Day as dictated by the train schedule. 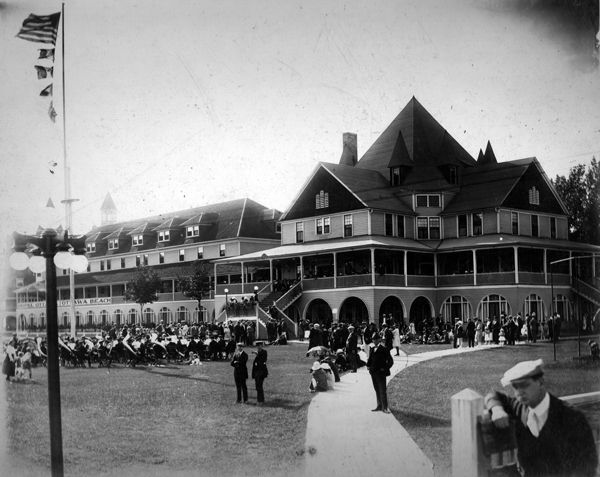 Although the 1890 season was a busy one for Ottawa Beach, most visitors came and left on Sundays and didn’t stay over at the Hotel Ottawa. By the end of the season, the West Michigan Park Association couldn’t make its payments and had to mortgage the fixtures of the hotel. 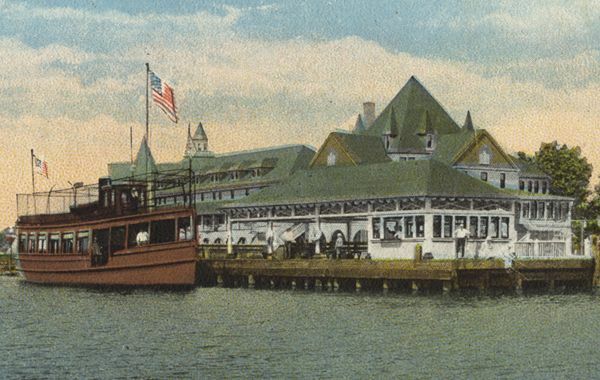 1891 saw several musical entertainments at the hotel, and the first of many Venetian Nights with decorated steam powered and sailboats parading around the western end of Lake Macatawa. The hotel was leased that year from the Association by Charles M. Heald, the head of the Chicago and West Michigan Railroad. The year 1894 was a disaster for the resort because of the the great economic recession which had begun the previous year in the USA. In the early 1900s, Boyd Pantlind took over management of the Hotel Ottawa from the Railway, then in1913, he purchased it outright. This photograph shows the hotel as it looked during Paintland’s ownership of it. 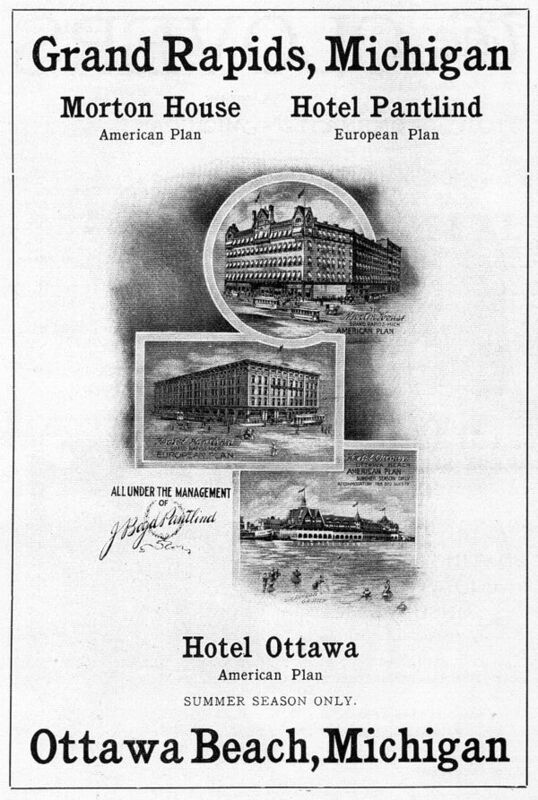 Mr. Pantlind’s success as a hotel operator may be seen in this advertisement from a 1907 Michigan resort guide. Pictured are the Morton House and Hotel Pantlind in Grand Rapids and the Hotel Ottawa. His granddaughter Katherine Pantlind Whinery and her family lived in the cottage next door to the Pantlind cottage on lot 33, built in 1902 by Marietta Ives.